One of the Conservancy of Southwest Florida’s most picturesque natural settings happens to be manmade – covered in native Florida marsh plants and calm settling ponds, it is a protected and fertile home to immature game fish, turtles, snakes, frogs and toads, and the preferred landing and feeding spot for numerous wading birds. The Shotwell Waverly Family Filter Marsh was created by the Conservancy’s environmental science team, with support from the Florida Department of Environmental Protection, South Florida Water Management District, the City of Naples and Collier County. It is designed to help prevent local drainage waters from polluting the Gordon River and Naples Bay. Extensive development since the 1950s has led to a dramatic decline in natural areas in and around Naples Bay – a study published in 2006 cited a loss of 72% of the mangroves, 91% of sea grasses and 82% of the oyster beds in just a few decades – gone after having been present for thousands of years. 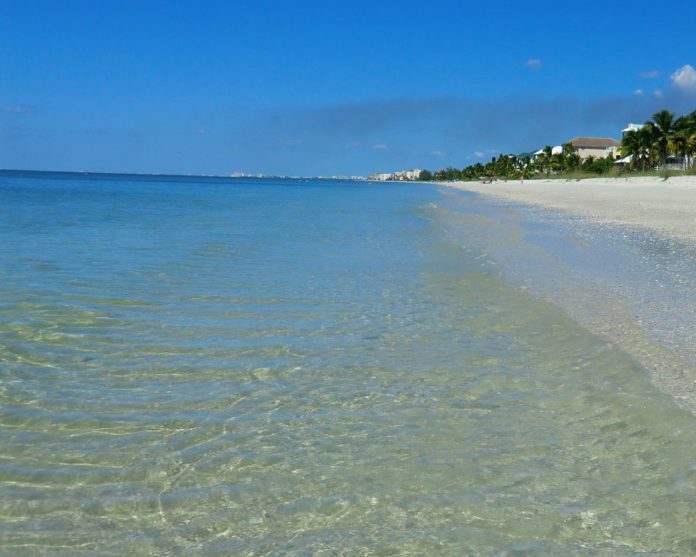 In addition, the building of roads, parking lots and sidewalks created vast areas of pavement impervious to rain, allowing storm water, mixed with pollutants, to flow unchecked into Naples Bay. Water running off from neighboring residences and commercial buildings had previously flowed through Conservancy grounds in a drainage ditch directly into the Gordon River, and from there into Naples Bay. High levels of dissolved nitrogen and phosphorous, commonly found in fertilizer, as well as other industrial chemicals, contaminated the runoff and the waterways. Recognizing the need to protect the river and bay waters, the Conservancy created a filter marsh. It cleans the draining storm water of pollutants and serves as an outdoor classroom to help educate and entertain both children and adults, and has become a natural home to native plants and animals. Located on the northeastern tip of the Conservancy grounds, the filter marsh is a well-planned natural retreat, with a wooden walkway leading to a covered wooden gazebo, allowing guests to peacefully enjoy the numerous birds and animals now found there. Runoff water enters a detention pond, where it is slowed, and then, gently and peacefully, it moves through the new plant-laden marsh, eventually draining into the Gordon River. Plants, soil, bacteria and numerous invertebrates are able to naturally filter out certain pollutants, if given the chance to do so. For example, marsh plants use nitrogen and phosphorous to promote their own growth, in turn providing food and habitat for birds, reptiles, amphibians and small mammals. The calm, protected waters in the marsh are the perfect place for immature fish to feed and grow, away from larger predators found in deeper waters. The filter marsh works well to reduce pollutants – monitoring shows that as much as 16% of the contaminating nitrogen and phosphorous is removed. The types of birds coming to the marsh after its construction changed dramatically, with many species of birds not see here before now seen routinely – herons, egrets , ducks – even bald eagles – are visitors to, and users of, the filter marsh. Immature snook, a popular game fish, hide from predators in the pond water, and native fish now outnumber invasive. The Conservancy’s filter marsh also serves as an outdoor learning experience for local schoolchildren. It is not unusual to see a dozen or so children, participating in the Conservancy’s “Watery Wonders” program or summer camp, knee deep in water and mud, dip nets in hand, slowly and deliberately wading through the water, at times excitedly calling out “look what I got!”. They are collecting water samples and plankton, and an occasional fish or snail, to take back into the Conservancy’s labs to look at under a microscope, while measuring the water for chemical impurities and pH. The Shotwell Waverly Family filter marsh is a man made, ‘natural wonder’ attracting waterfowl, serving as home to fishes, frogs, toads, snakes, turtles and numerous other small animals. It is capable of filtering out harmful polluting chemicals to keep our rivers and bays clean, and used as a an outdoor educational center, where schoolchildren learn about and witness what nature can do – and how our prudent stewardship of natural resources can benefit people, plants and animals. Learn more about the technical specifics of filter marshes here. Plan a visit to the Conservancy Nature Center and see the filter marsh, and much more, for yourself. Learn more about the Conservancy of Southwest Florida at www.conservancy.org. You can see it for yourself at Conservancy’s Nature Center seven days a week at 1495 Smith Preserve Way, Naples, Florida (just south of the Naples Zoo). To learn more about our work to protect the region’s water, land and wildlife, visit www.conservancy.org. 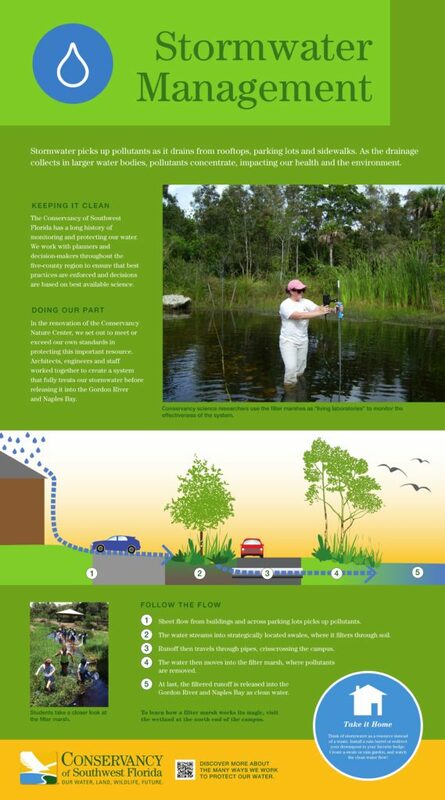 This is a fantastic example of using the earth’s natural systems to clean stormwater. Great article!